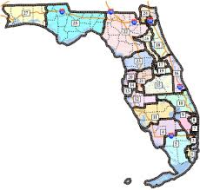 Florida Politics have brought lawmakers back to Tallahassee in special session to redraw the state’s 27 U. S. congressional districts map. In response to a ruling by Judge Terry Lewis last week ordering legislators to draw up a replacement map by Aug. 15. Judge Lewis ruled that the state’s congressional districts must be revised because Republican leaders improperly conspired to rig the boundaries to protect the party’s majority in Washington. Most notable is District 5. “Florida’s supervisors of elections have raised serious concerns over changing the elections process at this late date.” House and Senate committees appear to be largely in agreement with the revised maps with the expectation of the special session coming to a relatively quick close this week. Update: The Senate and House approved the revised new congressional map to comply with a judge’s order late afternoon Monday, August 10.